In March I wrote a post that garnered pretty widespread attention telling a tale of what appeared to be at the time exceptionally underhanded actions by a number of companies involved in emergency demolition work subsequent to the February 22nd earthquake. Suffice it to say I alleged that contractors involved in the demolition had stolen materials recovered from our building. After lots of spreading the word (including an interview on National Radio), and despite protestations from the official apparently tasked with supervising the demolition that “no salvageable items remains”, we miraculously found some of the purloined material back on site. It seemed that someone had been a little spooked by my stirring. At the time we mentioned, in passing, that we had had zero contact from either Civil Defence or the council (CERA hadn’t been formed at that time). That was still the case until recently – unless been on site ourselves, we would have had zero official confirmation that our building had actually been demolished. The other day however, I was advised that one of the co-owners had received a letter from CERA. The issues around delivering that letter are worth telling, if only to show the ineptitude of the process. The letter was posted to the address for service of one of the directors of the company owning the building. It appears that CERA went to the companies office website, picked the first person appearing in chronological order – and sent them a letter. This is a little odd considering we had registered with both Civil Defence and the Council, including giving accurate addresses and contact details. CERA chose not to use these details and rather picked a means of contact that was ineffective – ah well. In order to explain the astonishment we felt at receiving the letter (and the invoice it contained) it is important to set the scene. Subsequent to the September earthquake, but prior to the February event, we had made the difficult decision to demolish our building. 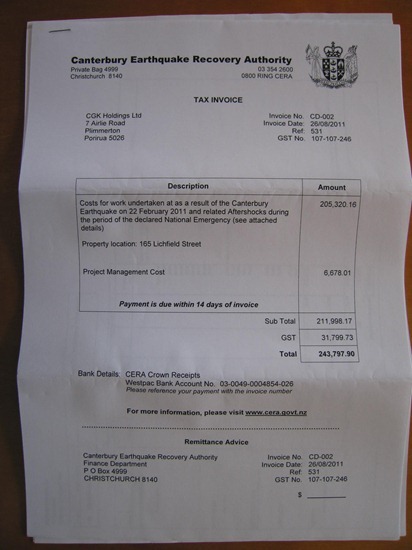 We actually obtained a quote from a demolition company for effecting the works for the sum of $54000 and these works had been started the week before the February quake. The demolition company spent a week or so on site, before being forced to move off by the February 22 quake. Yes, we were being charged 400% more than the price quoted by the original demolition company. 400%! Highway robbery anyone? 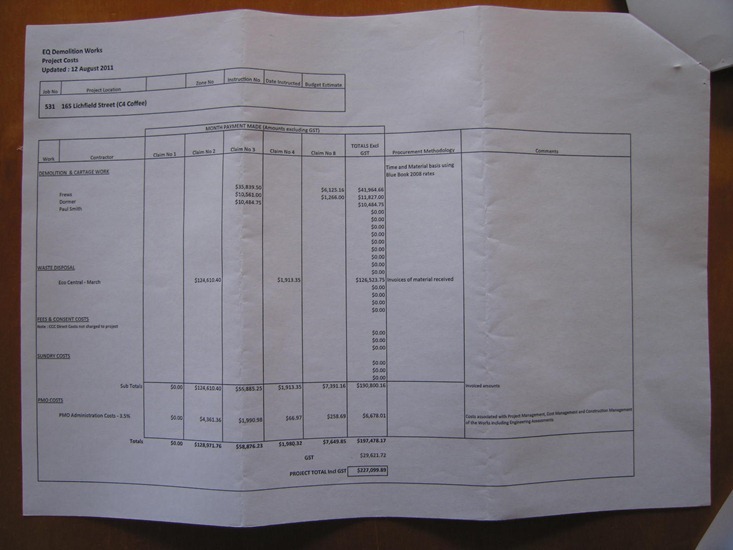 Wanting to dive deeper into this travesty, we looked into the breakdown for the invoicing, the following is a breakdown of work by the companies involved – Frews, Dormer, Paul Smith and March construction. We can see some pretty astronomical charges for waste disposal, and some interesting contracting charges. Frews salvage in particular was on site with a couple of excavators for around three days. They have seen fit to charge nearly $36000 for this work – I have friends in the general contracting industry and they would be supremely excited to be able to charge anything close to these sorts of rates. While it sounds a minor point, why does CERA refuse to use the communication channels that were put in place subsequent to the February event. How many other business owners have massive invoices that they have no knowledge of, only because CERA has been using old address details? What was the process for ordering emergency demolitions following February 22nd. While our building was obviously doomed, it wasn’t a time critical demo. Some might think that demolition companies had a hand in advocating that some buildings be demolished. Whatever happened to independent supervisors on-site during demolitions to ensure these contracting companies were being honest with their invoicing? Will CERA be investigating or peer reviewing these invoices or will they simply hand them over to building owners and “damn the torpedoes”? I always knew that bad things were happening in the weeks and months following the earthquake, I’m not lying the blame for what went on at CERA’s door, clearly they’re the face of a system that is completely broken and that, alas, some parties have decided to manipulate for their benefit. This story needs to be told, if for no other reason than to show the reality of what is happening in Christchurch. Wow, thank you for sharing what is likly to be a prolific problem for many. The waste disposal fee is just one that could have been avoided all together if the LPC Reclamation site was used. As there are no fees there at all, yet people continue to pay huge fees to go through council and other means. Disposal costs through the one certified site are $190/tonne. $125K of waste disposal would equate to 650 tonnes of waste. Any idea how much waste one would expect from a brick 3 story building? Clay brick is roughly 2 tonne per cubic metre… Estimating the volume of wall material should be reasonably easy to get a ballpark figure. I see an iPhone app in the making? Not so much…. Ben, what was the area of the building footprint, and will see what would be typical for you, thats crazy. great to get an owners perspective of whats going on. There is also the minor(?) issue of future insurance. With prices like that the insurance companies will be looking for NZ as a whole to recover/cover their present and future predicted losses. For of course they are here to make a profit. Thanks for sharing your story – it seems to be repeated across the CBD – My neighbour owned a heritage bldg in Lichfield St and despite having a quote for demolition he was proceeding with, was forced by CERA to let them demolish at a much more expensive rate. PS Random aside: Did you got to Redwood School?? Hey Sarah, thanks for the feedback, and yes – I went to Redwood school…. Each time I read an article/blog like this I get more despondent about what is happening here 🙁 Greed and stupidity seem to have the upper hand.